Texas Instruments introduced in the United States with the BA-20 a very useful calculator. Beside the basic calculator functions 6 additional keys enable the COST, SELL, MARGIN calculations. You enter either two of the variables and get instantly the result of the remaining value. The sibblings TI-1798 and TI-1796 introduced in the same timeframe lacked the financial calculation and other features. A small clock module with its own battery gives additional functionality to the Profit Manager. This first generation BA-20 Profit Manager introduced in 1986 makes use of a small sliding switch to select between the power sources. The second generation of the BA-20 replaced the switch with smart electronics. Don't miss the BA-45 Micro Business Manager and the rare TI-5310 Business Manager. 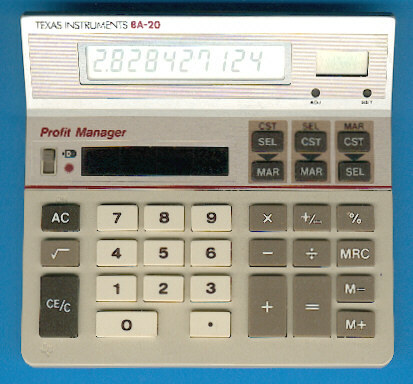 The BA-20 Profit Manager is featured in the Texas Instruments Incorporated bulletin CL-885 dated 1986.